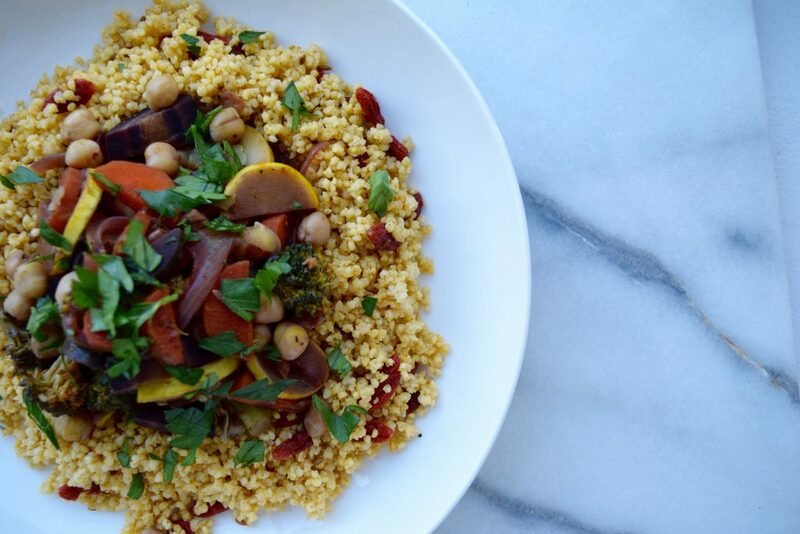 Inspired by the flavors and spices of Morocco, this hearty vegetable dish is similar to a tagine but cooks up in a fraction of the time. If you’ve ever been to a Moroccan restaurant, you know one of their signature dishes is a tagine: a slow cooked stew made in a special earthenware cooking dish with a tall, cone-shaped lid. They are absolutely delicious. The slow cooking really intensifies the flavor, and the tagine-lid keeps every morsel of food perfectly moist. But, without much space in a tiny NYC kitchen for another pot, nor the time to wait long for dinner to be served, this Moroccan-inspired recipe was born. While definitely not the most traditional recipe (which requires much more time!) it works for a busy urban weeknight dinner. In a small bowl, soak goji berries in a small amount of water, and set aside. Heat 1 Tbsp. oil in a medium saucepan over medium heat. Add millet and cumin seeds and cook, stirring, until beginning to brown, about 2 minutes. Add broth and bring to a boil. Reduce heat to medium low, cover, and simmer, stirring occasionally, until millet is tender, 15-20 minutes until water is absorbed. Drain goji berries, and stir them into the millet. Heat a large saucepan or pot over medium heat. Add the oil, then sauté the onion, garlic, and ginger for two minutes. Next, add the spices (except salt), harissa, and carrots. Allow to cook, stirring occasionally, for 3-4 minutes before adding the broccoli, zucchini, chickpeas, and vegetable stock. Cover, and cook over medium low heat for 15 minutes. To serve, spread about 1/2-3/4 cup millet couscous on a plate, and make a well in the middle. Scoop in 1-2 cups of the vegetable tagine. Garnish with generous amount of chopped parsley and mint (and more harissa if you like).